Plant polyphenols are showing particular promise as anti-aging nutrients. In three recent studies, polyphenols from apples extended lifespan in laboratory models by up to 12%. It seems the polyphenols activate genes which stimulate both endogenous antioxidant defences and inhibition of other genes involved in premature death. Epidemiological research confirms a positive correlation between consumption of flavonoids in general, and of apples in particular, and longevity. ¤ Phloridzin is one such polyphenol which is concentrated in apple peel. It is one of the chalcone flavonoids, which reduces insulin resistance and is effective at countering glycation via a number of synergistic mechanisms. Apples are similarly rich in chlorogenic acid (a key active in our green coffee extract too), catechin, epicatechin and various tannins. Apple polyphenols are also potent antioxidants with an ORAC value three times that of green tea extract. • Blocking agents of rapid post-prandial glucose absorption. Animal studies show inhibition of glucose absorption to be in the order of 60%. Formation of advanced glycation end-products (AGEs) is also considerably reduced. ¤ In research conducted on 45 overweight adults, daily supplementation with 600mg of apple polyphenols produced weight loss after 12 weeks, essentially in the form of reduced visceral fat, while in a different study, supplemented subjects lost 8.9% of their visceral fat in 16 weeks. A third study is underway to evaluate the effects of apple polyphenols on satiety and calorie absorption. 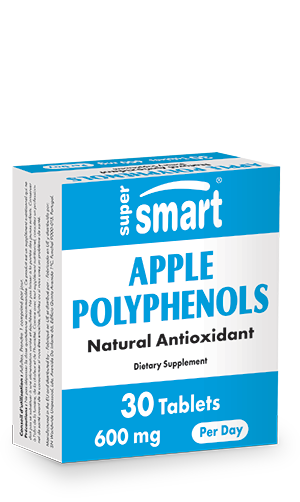 Apple Polyphenols supports the proverb that "an apple a day keeps the doctor away". It is a completely safe product, with no known side-effects, suitable for all health-conscious individuals concerned about their weight or metabolism. Other ingredients : Magnesium stearate, microcrystalline cellulose, silicon dioxide. Adults. Take one tablet daily.